If you are interested in a Big Green Egg, or if you are a proud, new owner of one, there are a few things you need to know. First, the Big Green Egg is not a gas grill. The Big Green Egg is in a class all its own, and has been featured as one of the best ways to grill and smoke on Alton Brown’s Good Eats on the Food Network and on Smoking Meat by Jeff Phillips. The Big Green Egg is a Kamado-style cooker made out of high-quality ceramic designed to keep heat and moisture in. When cooking with the Big Green Egg, it’s all about temperature. It’s incredibly diverse and can hold even temperatures for grilling, smoking and even baking food like wood-fired pizza or hearth breads. Tip #1: Use natural lump charcoal and good amount of smoking chips. It’s important to remember that the Big Green Egg is ceramic. It’s built to last a lifetime (or longer) and can withstand weather and high temperatures for decades. However, it should never be stored in a place where it cannot be knocked over. If you have an outdoor kitchen area, it is best practice to keep your Big Green Egg in a special place, like mounted in a table or counter. Remember, the bottom of the EGG can get extremely hot, so do not place your Big Green Egg directly onto a wood surface. If you’ve used a charcoal grill on a camping trip before, it may have taken some lighter fluid and hard work to get the charcoal lit. One of the best things about the Big Green Egg is that it is incredibly efficient. You should NOT use lighter fluid or stoke the coals. Leave the charcoal alone, close the lid, and sit back. It will come up to grilling temperature very quickly. The Big Green Egg is designed for maximum heat control and can maintain high temperatures for long periods of time. Whether you’re smoking meat or grilling, use the vents at the top and the bottom of the EGG to allow air flow. Want to check on your meat? THINK TWICE! Remember to “burp” your egg before opening the lid, and always open the lid slowly. The EGG can get extremely hot and you will need high-heat resistant gloves in order to place the grate and handle food. The old oven mitts will not do! There are many types of heat resistant gloves made especially for grilling. Protect your hands and invest in high-quality grilling gloves to go with your new Big Green Egg! For the last and most important tip, enjoy grilling great food! The Big Green Egg is a new and incredible grilling experience. Enjoy the best food you’ve ever made – smoky, juicy barbecue ribs, grilled summer vegetables, wood-fired pizza or perfectly grilled seafood. Fine’s Gas sells the EGG locally in the Chattanooga area. Come visit our store to see the Big Green Egg in all sizes. 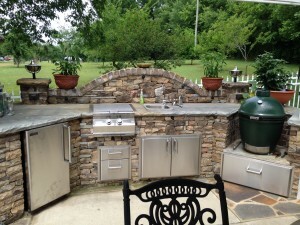 This entry was posted in Gas Grill Tips, Outdoor Kitchens and tagged big green egg, big green egg tips on August 5, 2015 by Rachael Watkins. We hope you’ve come to expect great tips and tricks from the Fine’s Gas blog! It’s our goal to provide information we think you’ll find relevant and valuable. Today, we wanted to let you know we’re adding a new topic to the mix: installations. We’ll be sharing progress updates, as well as showing off completed projects. 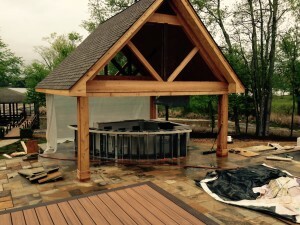 You’ll find outdoor kitchens, outdoor living spaces with fire pits and fireplaces, and more. 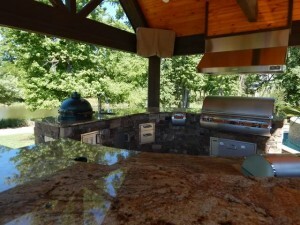 For our first installation post, we wanted to share photos of a great outdoor kitchen project that’s nearing completion. Take a look at these below, and let us know if you’re interested in starting a similar project! This entry was posted in Uncategorized on May 19, 2015 by Rachael Watkins. 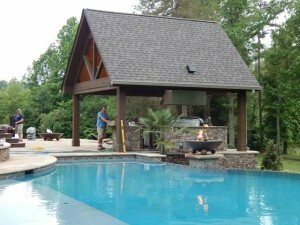 Turn a drab outdoor patio into an exciting outdoor living space that everyone can enjoy. You can make the most of your outdoor living area by extending your indoor living elements to the great outdoors. 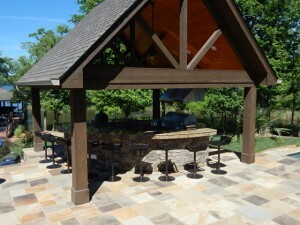 There are many simple and inexpensive ways to convert your outdoor patio into a fun and inviting area. One simple way to improve your outdoor area is to buy new outdoor furniture. If your old furniture is uncomfortable, outdated or worn, that may be the reason you don’t like spending time on your patio. If you enjoy a good DIY project, you may consider simply refinishing your current outdoor furniture (with paint or wood stain depending on the material it’s made of) and simply rearranging it to create an entirely new space. Outdoor rugs may also add some aesthetic interest, while making the space appear cozier and more inviting. You can also add some inexpensive lighting to your outdoor patio to make your space fun and useful even when it’s dark outside. If you are looking for more permanent and ornate lighting, Fine’s Gas has many outdoor gas lighting solutions, ranging from tiki torches to wall lights. Some simple lawn and gardening work can transform your drab patio into a spectacular outdoor living space. Spend a weekend planting new flowers and plants around your patio, and show your lawn some TLC. Improving the vegetation around your patio will create a healthier and richer environment for everyone to enjoy. New flowers and trees may also draw in birds and other wildlife, which can enhance the natural ambience of your outdoor space. 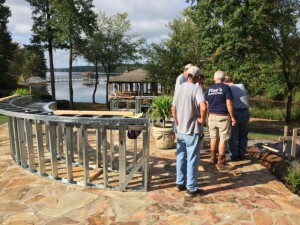 Building a fire pit is a great feature for any outdoor space. Having a fire pit in your patio creates a warm and cozy atmosphere where friends and family can gather around and enjoy each other’s company. 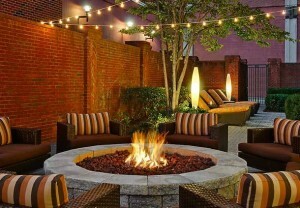 Fine’s gas has several fire pits to fit any outdoor living space. 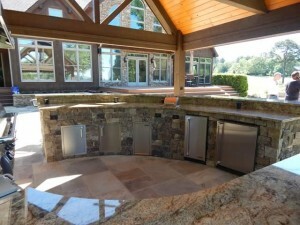 If you are looking to go all out with your outdoor living space, you may consider constructing an outdoor kitchen. 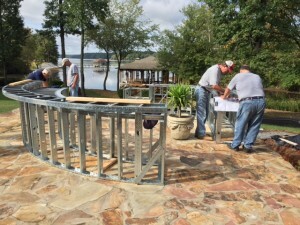 Whether you’d prefer to purchase three-in-one outdoor kitchen island or to build a fully-custom outdoor kitchen, the staff at Fine’s Gas can help. 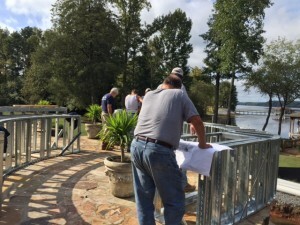 If you would like to learn more about our products and installation services, contact us! 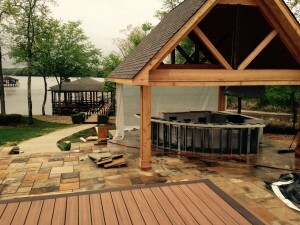 This entry was posted in Outdoor Kitchens on April 22, 2015 by Rachael Watkins. Once you’re sure your grill is in good shape, check out the following guide to safe meat cooking temperatures. We know that some people like their steaks and burgers very rare, but according to the U.S. Department of Health and Human Services, grill masters should be following internal cooking temperature guidelines to determine the safety of the foods they serve. Instead of relying on visuals—basing doneness on how “pink” your meats are—check the internal temperature with a meat thermometer. (A few of our grills even come with high-quality meat thermometers.) By following the suggestions below, you’ll be able to ensure the foods you grill this spring and summer will maintain their great flavor without the risk of illness due to undercooking. • Planning to use a marinade as a dressing for cooked meats? Make a little extra, and place that portion in a separate container. Using any of the mixture your meat has marinated in at the end of the cooking process could increase your risk for contamination. • Preheating your grill isn’t only for cooking purposes—it also kills bacteria that may have accumulated on your grill since the last time it was fired up. Don’t skip this step! • When preparing to transport uncooked meats to your grill, bring an extra, clean dish. Transfer cooked meats from the grill onto the clean dish to prevent contamination. • If you’re planning a party where folks will come and go and would prefer to cook extra burgers or hotdogs in advance, turn the grill down to around 140 degrees Fahrenheit and leave cooked meats on a side or upper rack to stay warm. 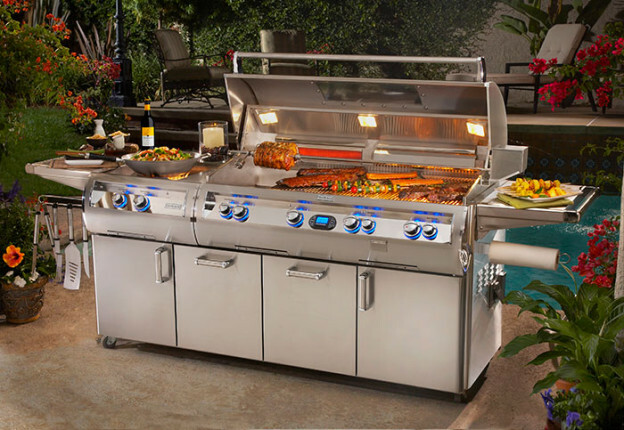 If you’re in need of a new grill, replacement parts, or even an entire outdoor kitchen installation, Fine’s Gas can help. Shop our products online or contact us for more information. This entry was posted in Uncategorized on April 6, 2015 by Rachael Watkins. 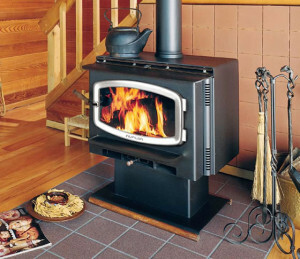 Considering purchasing a wood-burning cook stove? Wood-burning stoves are a fantastic source of supplemental heat and offer a unique charm that harkens back to the rustic living of early homesteaders. And with recent shifts in nutrition recommendations in which experts are recommending that people “cook like their grandmothers,” wood-burning stoves with cooktops seem like a natural choice. If you’ve seen this phrase laced into headlines and articles about “eating more butter” or “fat being back,” you’re likely already aware that many experts are denouncing the low-fat fad that grew to popularity in the 1970s and 1980s. In an effort to encourage a new way of thinking about food, the phrase “cook like your grandmother” came into being. Its goal is to encourage people to eat more fresh vegetables and replace processed, “low-fat” or “fat-free” items for more natural options such as butter and healthy oils. Why a Wood-Burning Cook Stove? Although your family won’t likely use a wood-burning cook stove in the way your ancestors did (gathered around the stove, a home’s primary source of heat, for warmth day and night), you’ll certainly enjoy its convenient dual-purpose functionality. By installing a wood-burning cook stove in a living room or den, you’ll add a new level of cozy ambience and gain the opportunity to really cook like your grandmother! We can’t think of a much better way to stay warm and cozy on a winter day than throwing some wood in a stove and putting on a pot of soup or stew. All you’ll need is a cast iron Dutch oven. Add your favorite mix of chopped veggies (red potatoes, onions, carrots, and celery are our favorites), stew meat, beef broth to cover, and salt and pepper to taste, and you’ll have a hearty beef stew in just a few hours. Essentially anything you would cook in a crock pot can be cooked on a wood-burning cook stove. Movie night with the family? Simmer hot chocolate or pop stove-top popcorn. The options are endless! If you’re interested in learning more about our wood-burning cook stoves, contact us today! Our team will walk you through your options and help you make the best selection for your family. *Please note our Avalon cook stove is not available for purchase online. Stop by our store for more information. 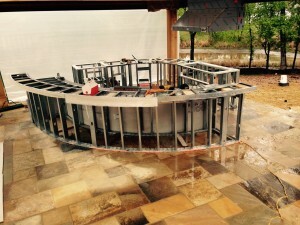 This entry was posted in Fireplaces, Wood-Burning Stoves on February 11, 2015 by Rachael Watkins. 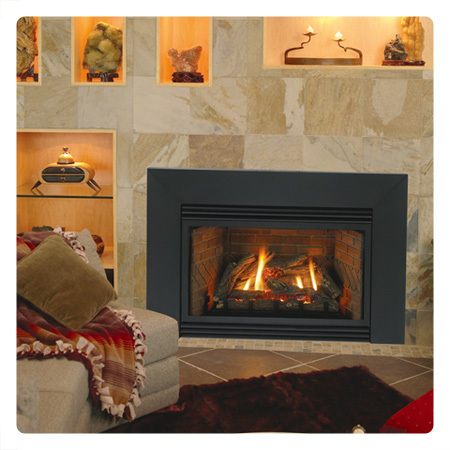 As the name would imply, ventless gas appliances, such as fireplaces or gas logs, operate without the necessity of any sort of vent. Requiring no chimney or flue, ventless appliances can be placed in essentially any room of your home, which makes them extremely convenient to install. And because no heat from a ventless appliance escapes to the outside, all the usable energy stays in the space, cutting down on heating bills during cold winter months. Since these appliances require no ventilation, some customers have expressed concerns regarding safety and indoor air quality. Fortunately, we can confidently say that ventless gas appliances are not only highly efficient but also extremely safe to use. The vent-free system works relatively simply. The “fire” consists of natural gas, propane, alcohol-based gels, and electricity. It burns at optimum efficiency in order to reduce the production of moisture and carbon dioxide for a well-ventilated room. At Fine’s gas, our number one priority is customer safety and satisfaction. There are a few steps to consider when investing in any sort of appliance that emits heat, vented or not. First and foremost, all homes—whether they have ventless heating appliances or not—should have a carbon monoxide detector. If you are considering investing in heating appliance, be sure it fits the area you are planning to put it in, and take note of its relation to drapes, walls, furniture, etc. Finally, always seek the help of a professional. Installing a heat source is not a do-it-yourself project. Fine’s Gas provides reliable experts to walk you through any purchase and answer any question you may have. 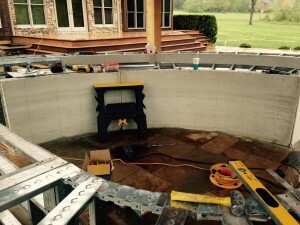 For more information on our products and services or to find out about the installation process, contact us today! This entry was posted in Fireplaces, Gas Fireplaces, Gas Logs, Ventless Gas Appliances on January 19, 2015 by Rachael Watkins. You may be surprised to learn that vent-free gas appliances produce water vapors, a process that occurs naturally when burning a combination of gas and air. This is especially valuable since during colder months, the relative humidity—or the percentage of water vapor in the air—is low. According to the Mayo Clinic, low humidity can lead to dry skin, throat, and sinuses, as well as cause eye irritation. If you or a loved one experiences these symptoms or respiratory illnesses in the winter, you may want to consider purchasing a ventless fireplace or vent-free gas logs. The Association of Home Appliance Manufacturers, the trade association for the humidifier industry, recommends a 60% indoor relative humidity. Water vapors in your home come from a variety of sources, such as dishwashers, ranges, and showers. To improve the level of comfort and reduce symptoms like sore throat and nasal dryness, many people add humidification with either a portable or whole-house system. Keep in mind that a home is not airtight. 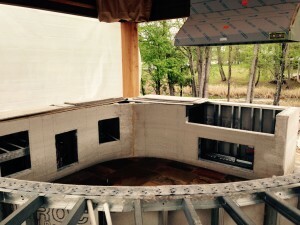 Even one built to the tightest construction standards allowed by codes still has at least 0.35 air exchanges per hour. This means the higher-humidity indoor air is constantly being replaced by lower-humidity outdoor air. You’ve probably noticed cold air leaks around the windows and doors in your own home during winter. That’s indicative of air exchange taking place. While vent-free products increase the relative humidity, the air exchange decreases the relative humidity, which can help you achieve and optimum level of humidity in your home. How Does a Vent-Free Appliance Work in a Tightly Constructed Home? The answer is very well. It’s simple: A well-constructed home requires less heating, and as a result, the appliance will operate for a shorter period of time and produce less water vapor. Of course, in average homes, particularly those located in the most northern climates, you may notice some condensation on cold surfaces such as the inside of the windows. However, this condition is indicative of the weather and the construction, and would most likely exist whether or not a vent-free appliance is present. 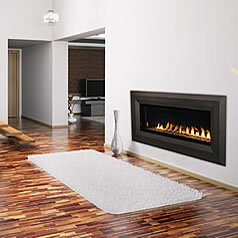 If you’d like to learn more about the benefits of vent-free gas logs and fireplaces, view our FAQs or contact us today! This entry was posted in Fireplaces, Gas Fireplaces, Ventless Gas Appliances on November 24, 2014 by Rachael Watkins. Although millions of American homeowners commonly use vent-free gas logs, there is still some confusion in the marketplace about these products. Even worse, much of this confusion is based on the dissemination of inaccuracies and misconceptions about ventless products. Fine’s Gas would like to address some of these fallacies and provide you with the facts. Myth: Vent-free gas appliances cause health problems. Fact: While some people may have special sensitivity to various household environmental factors, there are no independent, documented studies that show vent-free products cause illness or negative health effects. On the other hand, a thorough, well-documented independent study has been conducted on the effects of vent-free gas product emissions. The study concluded that vent-free gas logs performed well within all nationally recognized guidelines for indoor air quality. Myth: Carbon monoxide (CO) emissions from vent-free gas logs may be an issue, especially in households with children, pregnant women, and elderly people. Fact: The effects of vent-free gas logs emissions on sensitive populations have been tested extensively. Researchers used the recommended maximum levels of CO as set by the Consumer Product Safety Commission (CPSC) with sensitive populations, such as children, pregnant women, and the elderly, as the benchmark. The results of the research proved that vent-free gas heating products performed well within the CPSC guidelines for carbon monoxide and all other indoor air quality guidelines by OSHA, NIOSH and ASHRAE. Myth: There is no standard that regulates the safety of vent-free logs. Fact: Vent-free gas logs conform to the national product safety standard, ANSI Z21.11.2. This standard mandates many construction and performance requirements that, among others, include tests for proper combustion under abnormal conditions. All vent-free gas products sold in the U.S. are certified by recognized listing agencies for compliance with this ANSI standard to assure their safety and performance. Myth: There is nothing to prevent a thrifty homeowner from using ventless gas logs as a sole heat source. Fact: All major building codes categorize vent-free gas logs for supplemental use and require that a primary source of heat (e.g., a furnace) be present in the home before a ventless product can be installed. It is clearly stated in the operating instructions of every vent-free appliance that they be used only for supplemental heating. Myth: There are many places where vent-free gas logs are not accepted for use. Fact: Currently, the vast majority of states in the U.S. allow for the sale and installation of vent-free supplemental gas heat appliances. International Mechanical Code (IMC), the National Fuel Gas Code, and most other codes in the U.S. allow for vent-free appliances. Unfortunately, the Uniform Mechanical Code (UMC) does not permit the use of ventless products; however, many localities are now adopting the IMC over the UMC, and therefore, allowing the use of vent-free products. Myth: Vent-free gas logs produce too much heat in tightly constructed homes. Fact: The heat output of properly sized vent-free products can be easily controlled by the homeowner and set to the desired comfort level. However, installers of vent-free gas logs in homes that have extremely tight construction should be sure to follow the manufacturer’s instructions and building code requirements for supplying ventilation and combustion air. In some cases, additional mechanical ventilation may need to be added before installing a vent-free gas heating appliance. Myth: Ceiling fans should not be installed in rooms with vent-free fireplaces. Fact: Ceiling fans may be used to help distribute the heat. However, fans should not be allowed to blow directly into the fireplace to avoid any drafts that alter burner flame patterns, which can result in sooting. Myth: All vent-free appliances have inputs of as much as 40,000 BTU of heat, but most rooms need only 5,000 to 15,000. Fact: Nearly all ventless gas logs have manual or thermostatic controls that let the homeowner adjust the input rating to the preferred level of heating (e.g., low to high). Vent-free appliances come in a variety of sizes, ranging from inputs of 8,000 BTU to a maximum of 40,000 BTU. Smaller units are available for bathrooms (2,000 to 6,000 BTU) and bedrooms (10,000 BTU). Manufacturers provide clear sizing guidelines with their products. 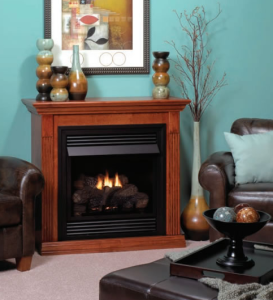 Have additional questions about vent-free gas logs and fireplaces? View our FAQ pages, or contact our team today! This entry was posted in Gas Fireplaces, Gas Logs, Ventless Gas Appliances on November 12, 2014 by Rachael Watkins. Why Buy Expensive BBQ Grills? Buying a gas grill can be a difficult and confusing process unless you know what to look for. Most large retail outlet stores for home products have grills of average size ranging from $199.99 up to $1,000 or more. So what is the big difference between these grills and a gas grill from a specialty retailer? After all, they have the same features and accessories. They have the same number of burners and the same BTU rating. 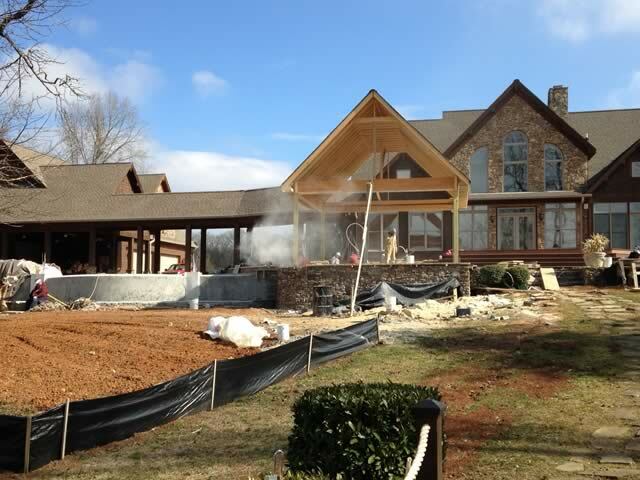 All gas and charcoal grills are going to have a nice curb appeal. While curb appeal goes a long way, opening the lid and taking a look at the actual operation and cooking equipment, like cooking grids and burners, is important. 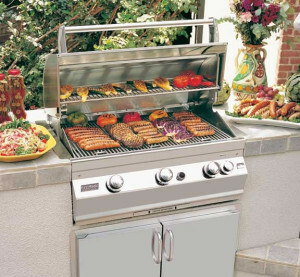 If you see an all stainless steel gas grill, the equipment inside the grill is not necessarily stainless steel. 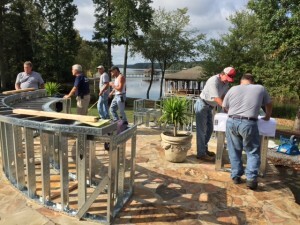 Many basic stainless models will have a porcelain-coated steel lining inside the grill and will rust quickly. Look for stainless steel or cast iron cooking grids, and avoid porcelain cooking grids because the porcelain coating will wear off and the grid will begin to rust. Cast iron grids require a little more maintenance like seasoning and oiling, but they hold their heat and sear meat better than any other grids. Stainless steel grids are the easiest to maintain and will still make nice sear marks. Burners are the most important part of a grill, so take a magnet with you to see if the burners are made of steel. If a magnet will stick to the burner, do not expect it to last more than one season because they will rust quickly due to the heat, salts and grease. Stainless steel tube-style burners are used in the majority of grills, and they will last from 5 to 7 years if they are made from high quality 304 stainless steel. Cast iron burners must be made from high quality iron, but remember to clean the burner ports regularly because cast iron will rust, causing the port to prevent proper gas flow. The best burners are cast steel burners found in Fire Magic grills and a few other brands, which are long-lasting and often covered with a warranty. Sometimes called a rock rack, lava coals, flamer tamer, flavor grid or heat diffuser, this device is found between the burner and the cooking grids. This piece will suffer from the most wear and tear because of the high heat from the burners below and the salt and grease dripping from the food above. If the Flavor Grid is made from porcelain-coated steel, do not expect it to last more than a year. Instead, look for high quality thick stainless steel with at least a 2 year warranty. Great grills are worth the money you invest in them. Look for products with 10 year or lifetime warranties on the grilling equipment. Also, many quality gas grills are made in the United States, which means you will have better access to service and replacement parts. There is nothing worse than needing a simple replacement part and finding out that the manufacturer has discontinued that part or model. Ultimately, a grill can be a great investment that can last decades with regular maintenance. At Fine’s Gas, some of our customers have been using the same grill for over 25 years! While the price of a quality grill may be surprising on first glance, the overall cost of parts and service is usually cheaper and your grill will last longer. This entry was posted in Gas Grill Tips and tagged fire magic grill, gas grills on September 5, 2014 by Rachael Watkins. Grilling season is just around the corner! Get your gas grill ready to fire up for the summer with four simple tips from Fine’s Gas on how to clean your grill. Maintaining your grill, especially if it has been sitting all winter, is an important part of extending the lifetime of your grill and ensuring that you continue to get the same great flavor and cooking ability. Inexpensive charcoal grills or tabletop grills will inevitably have some wear and tear overtime, but a quality stainless steel gas grill can last a lifetime with the right care. 1. Remove spider webs from gas valve openings. Spiders love propane. Especially in winter, spiders will spin webs inside gas valve openings because they are attracted to propane gas. These webs can create a potential hazard as well as impact the utility of your grill. 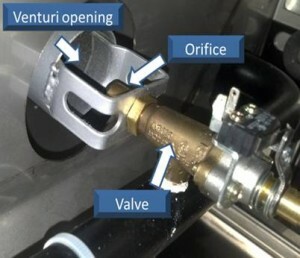 Be sure to clean all around these areas to get rid of any webs to ensure smooth flow of gas to your burners. Covering your gas grill after use and during off seasons can help deter spiders and other insects from nesting in your grill. If you need a grill cover, we sell covers for many of the leading brands, including AOG grills, Broilmaster, and more. 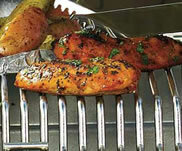 • Take out cooking grates, briquette trays and burners. • Inspect the venture opening and orifice for any signs or spiders or webbing. • Use a small wire or straightened paper clip to clear out any other obstacles. If the blockage will not come out, you may have to remove the orifice with a ½ inch deep socket to clear the blockage. • Check all burner ports for blockage from cooking debris and grease. Use the paper clip and poke through any ports that appear to be blocked or restricted. Do not do this step if you have ceramic ProSear burners or damage may occur. 2. Clean out the grill firebox. Debris, grease and other substances can build up over time inside your grill and impact your gas grill’s cooking ability. To prep your grill for the season, remove the grates and check the inside of the grill to remove any build-up. 3. Check all hoses and fittings for wear and tear. Your outdoor kitchen relies on your gas supply to light the burners and cook – ensuring that your gas hoses and fittings have no leaks or tears is integral to efficient and effective use. Make sure all gas fittings and hoses are tightly secured and free of any wear and tear. Inspect closely for cracks and abrasions, and test your fittings for leaks by applying a solution of 1:3 dish soap and water to all connections. If bubbles form when the soapy solution is applied, it could indicate a gas leak. These must be repaired or replaced prior to using your grill. Contact your local gas grill retailer or the experts at Fine’s Gas for advice on repairing fittings and hoses. 4. Check all wiring connections for frayed or chewed areas. Rodents love to chew on wiring, and they will often strip the plastic to use in their nests. Check where the wires are connected to the transformer. If you notice signs of chewing, you will need to order a new transformer for your grill. To avoid damage, you may want to store the transformer insider when your grill is sitting idle for some time. This entry was posted in Gas Grill Tips and tagged gas grill cleaning, gas grills, propane on July 17, 2014 by Rachael Watkins.